We are finally to PINK! The non-tangible world- the spiritual world- the place that you can feel but rarely see. The place that you might doubt is there – that’s the geography of pink. Pink helps you suss out the intentions of others. We have five pink ladies this year. If your color is pink, check your email, friend, because I’ve emailed you a sweet treat! Fun, fun, fun – I LOVE this Bridget! My color is Peony and I’ve made a donation to Southern Poverty Law Center. 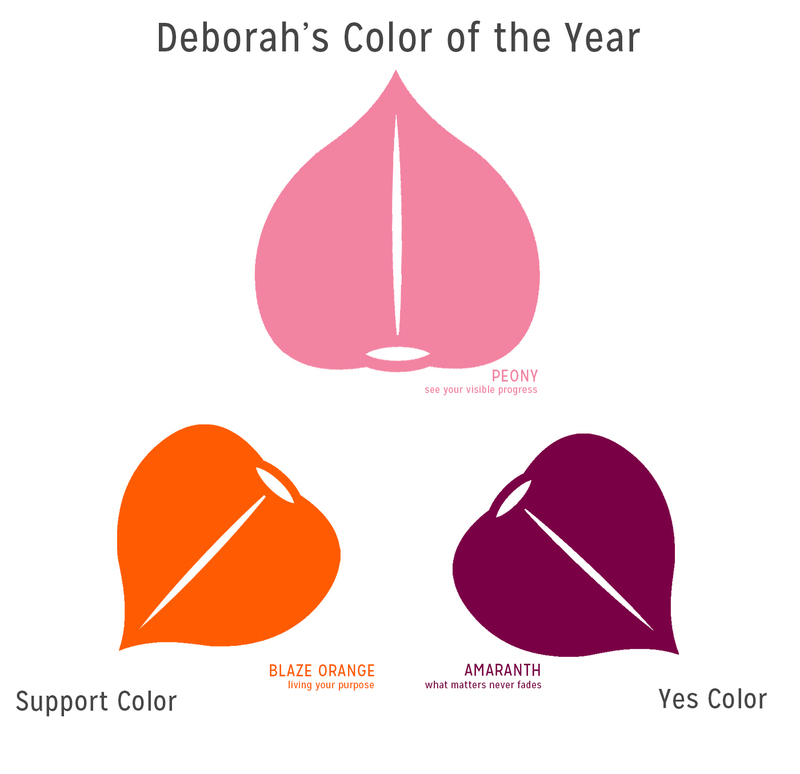 Deborah- your palette reminds me of the houses in Puerto Rico, bright exteriors and lots of light. I’ve been stuck on this idea of convergence lately. Things rising and meeting, blending, being changed by, moving again. That’s a kind of progress, though it’s not what we think of, when we think of progress, is it? We think of progress as a singular effort, our own progress, towards something. That’s not bad. It’s just that the world doesn’t usually work that way. We live in a world of circles and spirals, and convergence. Our progress is never really just our own. It’s not supposed to be. So when you are called out as the one who has made the difference, it may feel like a shoe that doesn’t fit right. You will be at a loss for words. Practice your acceptance speeches. Progress requires acceptance. Acceptance requires a person to realize they did something. And yet, we never do anything alone. Practice saying, “Yes and…” or “Yes, but also”. Feel how progress is convergence. Don’t lose yourself in it, unless it’s so delicious that you just can’t stop. To support you, I give you Blaze Orange- wear it when you are ready to live your purpose. And your yes color, it’s Amaranth. You’ll see it when you need to be reminded that what matters never fades. Bougainvillea, and I donated recently to head start and the nurturing center, does that count? When I was in 5th grade, I’d sit in the back of the classroom, and tip my head back to watch the butterflies. I’d close my eyes and let the colors wash over me, flicks of light against a background that was never quite discernible. I knew it wasn’t the same real as my desk, but I had no idea what it was. This was a kind of intuition, though I didn’t realize it at the time. It was the light of the other side. It was such a pleasure to be there, surrounded by people learning math, and there I was watching the butterflies, away from the limited world. You’ve picked an unlimited color. You’ve picked the color of the quick and nimble mind. It’s wonderful and satisfying to have this experience. It’s a blessing that not all of us find. And it comes at a cost. You’re in a body, a physical body that’s not used to the energy you are running through it. It’s not hard to become an exhausted and anxious rabbit. You have to keep yourself attached to the tangible world, because that’s where you are right now. A life is a like a meal. At the time, it’s important. In the vast length of all our lives, it make strike a memory. Or it may be utterly forgotten. You may be here to live on in the memory of someone else. So, in the context of the soul, it’s both irrelevant and vital that we are here, doing what we’re doing. When you have a quick and nimble mind, you have to stay here. Because here and now is where it’s happening, in this limited tangible world. Keeping the tension between your boundless intuition and your present body is what keeps you from ending up in knots. To support you in this endeavor, I give you Guazuvira Granite, this dark red will ground you. Wear it when you want a solid ballast for your intuitive journey. 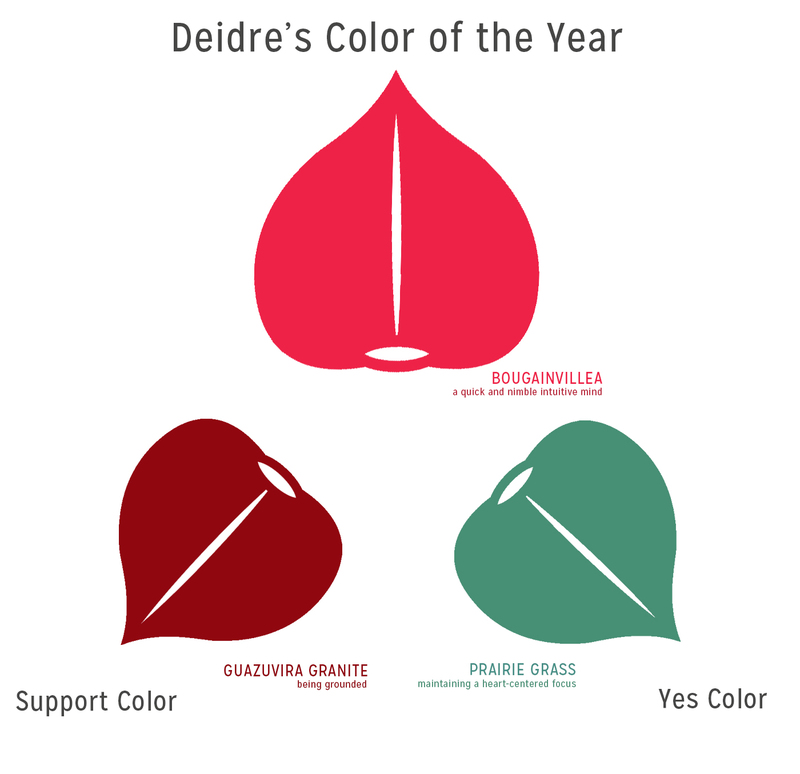 And your Yes color, it’s Prairie Grass. You’ll see it to remind you to maintain a heart-centered focus. Donation to the local animal shelter that just rescued 100 cats at once! eep! How does one accumulate a hundred cats? That’s soul-sucking madness. I am so happy that the rescue of these cats happened, and I hope they’ve all found good homes. You also chose the quick and nimble intuitive mind. You’re going back to the origin, and following the string back to you. It’s a maturation that you are so ready for. You will be so different when this is over. I have nearly no advice for you, because you’re ready and it’s just going to happen. When you are drawn back to the beginning, which is, of course, not really a beginning, but maybe the start of what we can understand, what you know will ripple and change. You’ll find yourself surrounded by people who don’t know it, who are building their own understanding of what’s happening, with the clues they are given. The beauty of connecting to the origin is the gift of humility, and its twin, allowing. And, this gift of a nimble intuitive mind means you don’t have to capture everything consciously, instead the understanding will unfold for the rest of this life and into the next and the next. To support you- it’s star dust. This nebulous color is hard to find, so part of your journey will be finding and wearing a touch of it. Wear it as part of your ritual. 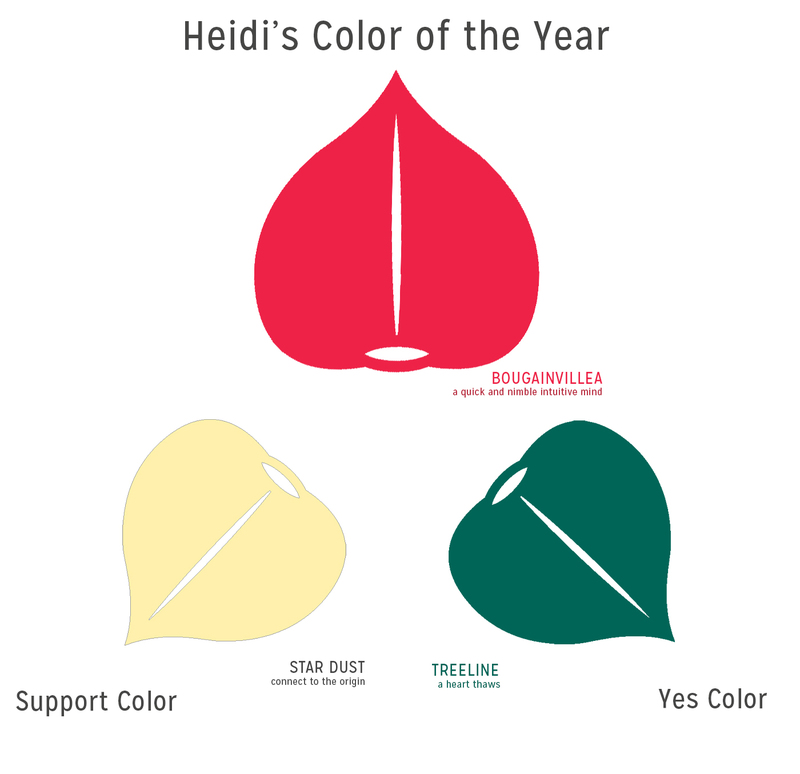 And then your YES color, it’s Treeline. It’s the color of green where the trees start growing, out on the edge of cold and dry. You’ll see it to remind you that your heart is thawing. And not just yours. Nothing happens to just one of us. My first Color of the Year year! WEEEHAW. I pick petra pink. I donated this month to the Community Food Bank of Southern Arizona. In this very big and very spread out city all of my neighbors deserve meals that nourish their bodies, which translates out to nourishing the whole of them and the whole of this great city and beyond. Finding hidden wonders means being open to the possibility of any thing. I’ve found hidden wonders on the London tube and deep in the forest. Finding hidden wonders requires presence. And a willingness to be solid in the realization of our brief, tiny existence. We’re so small and our time here is so brief. But we are still very real and very much here. Finding hidden wonders requires us to recognize the redundancy of nature; which requires us to recognize and revel in our own redundancy. Somewhere, in the world, a sensitive woman named Bridget is writing a note to another Peggie. The world is that way because what we do is so necessary. And how wonderful is it to not just carry the burden of our own self? To support you on this journey, I give you Buttecup. Hidden wonders are easiest on our top four chakras- the heart, the throat, the third eye, the crown. That’s where the easy, pleasure is. The work is done by that workhorse, the third chakra- the place of power and self. When you need to be reminded of your own ease and power, wear the color of relaxed self-assurance, Buttercup. Your Yes color, it’s one of my very very favorites. I am so thankful that stores aren’t filled with this color, because I would be broke! Brilliant Green will find you when you needed to be reminded of your emotional intelligence. Who am I with these colors?! I’m usually a blue or green or light yellow! I’m donating to Alpha Project San Diego who helps our most at-risk house-less neighbors at every stage. Yep, you are tightly in the reds this year. That’s okay. What’s wrong with a safe choice? Isn’t it enough to be traveling in a fragile body, surrounded by fragile loved ones, on a rock that is flying through cold space, with only six miles of atmosphere protecting us? Berry is the safe choice. The deepest pink, it’s grounding and provides good self-care for that sensitive third eye. Also, Red Canna can’t be denied. I put it as your pip. Okay, it’s going to be a year of juxtapositions, and if I was going to continue to add to your palette, I’d pick a a purple and a light, bright purple-pink. The chakra uses a buddy system, and the best friend of the root chakra is the crown (that’s the 1st and the 7th, for those that like the numbers). And, if you want to know a wee bit more, the 2nd and 6th are pals, and the 3rd and the 5th. The heart stands alone. How does the chakra buddy system work? When you are deep in center field with the reds, you are being supported by the purples. When you are inward and grounded and feeling limited and tangible, maybe a little stuck fast and overwhelmed by the deep, you are being held up and loved up by divine energy, and your spiritual guides and all that ethereal good. Lightness is accessible to take the support you. So please ask for it. Being in the reds isn’t bad, and your reds are some of the best ones. I’d be worried for you if oxblood popped up, or if there was a black in your palette. You do so well being up in those top chakras, and having an energy that’s nimble and quick. This is going to be different. There will be some heartbreak. It can’t be helped. And that’s why the reds are here. You need the earthiness. You need the descent into the deep tangible. But you’re not persephone. This isn’t a long stay. And the colors that you have are active and mutable and you won’t be stuck fast. So berry- balance and move forward. This is literally a body thing. Use your physical body to balance and move forward. Rest in this color. It’s okay to hold back and gather your ducks before you move. To support you, as things start getting tense and tight, it’s Barnstormer Red. This bright, barn red, it’s here to help you fly through the tight places. You will not get any more value by sticking around in places that feel wrong to your intuition. You don’t need to be dragged down by others that you understand to be needy, and whose needs really need to be met by someone else. You can tell the difference between who you are here to help in tight places (those who to bring along on the plane), and those who don’t want to change but just want you to sit in the problems they’ve caused for themselves. That Polish proverb- Not my circus, Not my monkeys applies. So wear barnstormer red when things are tight. You don’t need to wear a ton of it. You can wear what you want. But wear a little of it when you need it. 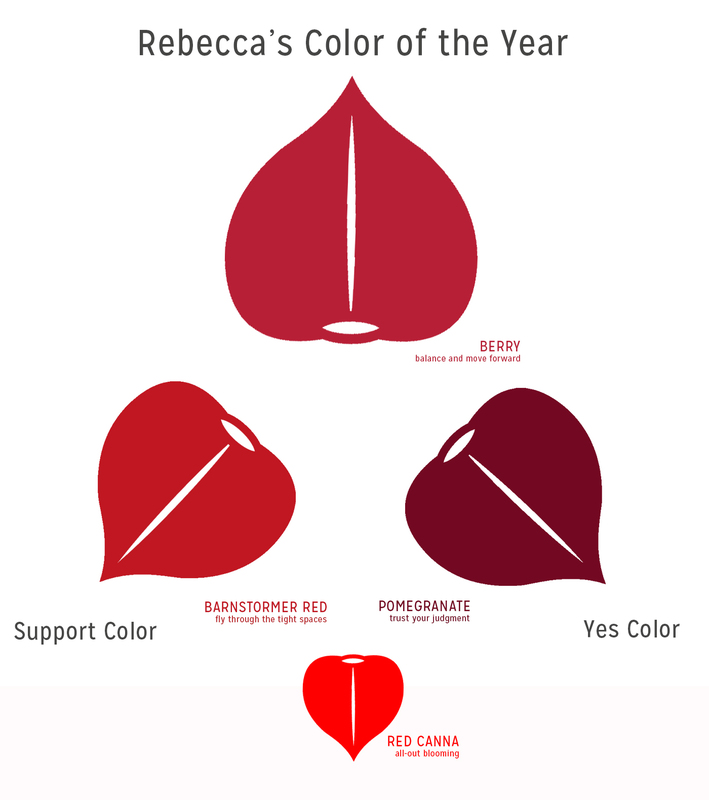 Your Yes color (ironically) is Pomegranate. You will see this vibrant purple-red when you need to be reminded that your judgment is spot-on and you can trust it. Oh girl, here’s that pip of yours. The Red Canna- sometimes what comes with a hard time is the freedom to bloom when it’s over. All-out blooming in a bright orange-red. When the time is right, possibly at the end of this journey, don’t be afraid to shine. And also, don’t be afraid to throw in some aqua if you’re having trouble getting your truth out. And remember, please, to give zero fucks to those who are wasting your time and attention. With all you’ve had on your plate… You write this for me! You are a being to be cherished and your words will reside on my heart… So that when it breaks, they fall in and I can really feel them. Always so spot on. Can’t wait for the rest of this year. Love to you! As for that cats, it is sadly a situation where a person has on multiple occasions opened up her own “shelter” taken grant money and accolades, but left the animals in not so good conditions. But they are safe now! Bridget – thank you from the wholeness of my heart. This is such a gift! When something “feels” right and transformative there’s that little click that seems to adjust things into alignment. I feel so inspired and supported by this, and know this will be a brilliant help to me throughout the year. Thank you!